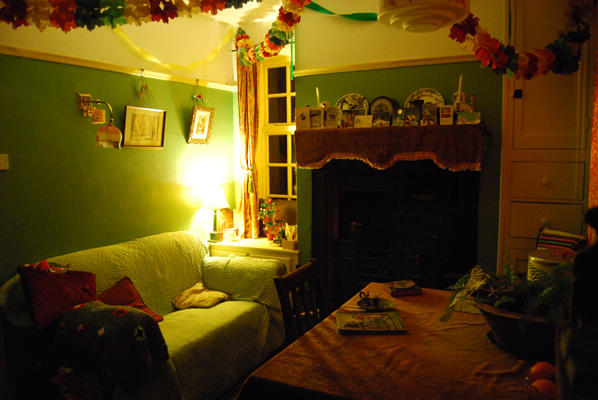 Happy Christmas Eve, from the 1930s House! It’s been a while since I posted, due to other commitments. Investigations have begun again on the late 1920s - early 1930s house ‘Lymehurst’, this year focusing upon the two ground floor fireplaces. This post will update the findings so far in the ‘Lounge’. The ‘Lounge’ fireplace appears to retain the original wooden (light oak?) surround, and fender. Removal of the fender shows that the original ceramic hearth tiles remain in place, but are covered by a (1990s Italian?) marble hearthstone. On removing the late wallpaper from the Lounge walls in 2010, a dark brown paint was revealed, which appears to be the original paint, and (in the absence of evidence to suggest otherwise), was probably the first wall decoration / covering. 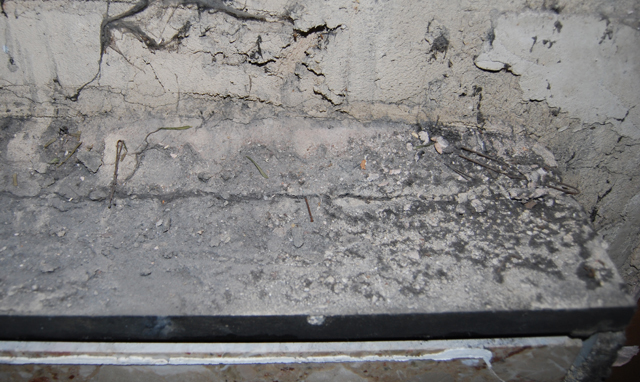 After removal of the surround, it can be seen by the distribution of the paint, and by the rough plaster beneath the wooden surround, that the latter is likely to have been installed during construction of the house. 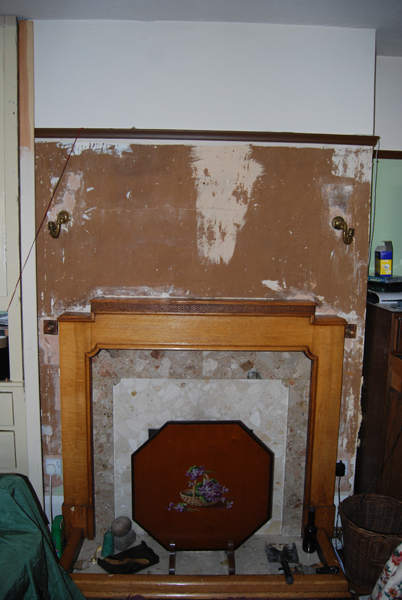 Removal makes it possible to see through a narrow gap the preservation of original ceramic tiles beneath (but at a few inches behind) the later marble face on the chimney-breast face (unfortunately this doesn't show up on photos). From the little that could be seen, the tiles are c.4" square and (typically for the period) light brown in colour, and probably match the mottled buff-coloured tiles that are visible beneath the modern marble hearthstone. To each side of the modern marble face are slab-like columns of dark grey concrete (which on first appearance might have been modern, i.e. later C20), above and resting upon which is a horizontal slate slab. However, the presence of what may be early concrete and gypsum plaster above this and the concrete plinths point towards an early date. (The box-like construction of the surround will have stood proud of the wall, leaving a gap of several inches between its front and the tiles that face the chimney-breast wall.) There are also surface marks that suggest that tiles previously faced the concrete. 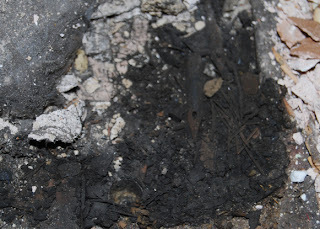 The paler cement noted above fills a gap between the slate and the wall, which is paler that the dark grey cement; above this, amongst dust and other debris, are a number of (late 20th – early 21st) hair-grips, and a ‘bobby pin’ that may date between the early 20th century and present day. It seems likely that these objects have fallen between the narrow gap that separated the wall and wooden fire surround; it might further be surmised that their presence indicates the presence of a mirror above the fireplace, at one time, or at times, in the past, which was used by women when dressing their hair. A number of long tacks were also found – either associated with the fire surround, the remnants of early fittings such as the extant picture rail, or possibly relating to the tacking of objects to the wall or picture rail. Beneath the feet of the fire surround were burnt material, presumably swept from the hearth; in amongst this was a pen nib, of unknown date, possibly (but far from certainly) disposed of by throwing into the once 'open' solid fuel fire. 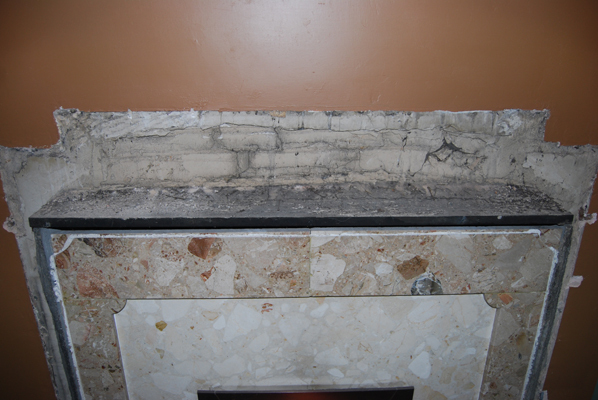 The later marble was removed to fully reveal the earlier tiles; the gap between the modern marble and the earlier tiles was, it seems, necessary for the gas fire to fit in the opening (as the gas fire is deeper). The condition of the chimney-breast tiles is not too bad (cracked in a few places, but not very noticeable; and cut above the opening). Original (or at least early) fireplace tiles. However, the hearth tiles haven't fared so well. 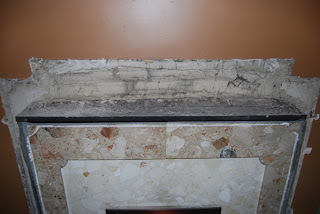 The marble hearth stone can away relatively easily; but it became immediately obvious that installation of the gas fire (perhaps in the early 90s) cut through the hearth to tap the gas supply from a pipe beneath. This pipe is likely to have led to a tap (an example can he seen here, near the bottom of the page) at the side of the fire (though the position of this seems to close to the fire for safety), and may have been used as a plug-in gas point. Such points served 'gas-pokers' - a flexible pipe that provided a gas jet with which solid fuel fires might be lit - common during the 20s & 30s (and not always safe! ), or portable gas fires. The opening for the fireplace was probably lined with a clay fire-back, although if so this has since been removed; the concrete at the bottom of the fire is likely to be a late 20th century insertion, to provide a level base for the gas fire that has just been removed. What follows over the next three posts are the (often mundane but frequently telling) traces of human action that may be used, in conjunction with other forms of evidence, and alongside comparisons of similar contexts, to consider the changing use and significance of the front room of No. 8. Amongst the minutiae are more general discussions on living conditions in this house at different times – since its construction during the late Victorian period, and in comparison with those of today – exploring the impact of technological transformations upon daily life. If readers have personal or family memories that might expand upon this information, and would like to share their thoughts, please comment at the bottom of the post, or contact the Project Director. Many details have surely been missed, and some may have been misunderstood. Many of the features described below potentially survive in other local terraced houses: if readers living in comparable homes may be able to add to these discoveries, so please send in information if encountering similar evidence of earlier activity. If readers based outside Derby would like to contribute information, a geographically wider project (with similar aims to Dec20) can be found here. 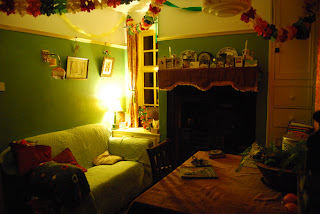 This first post on the front room will begin by describing the room, looking at architectural and decorative features. The second will consider ‘home comforts’: warmth and lighting; and the third will consider decoration; the fourth will explore the social and cultural significance of the front room. On entering through the front door, the visitor steps straight into the front room, which is a comfortable size for a small terraced house (though slightly smaller than some of the other houses in the terrace), measuring approx. 10 1/2’ x 11 1/3’ (c. 3.21 m x 3.46 m). From the front of the house, it was evident from the chimneys that a solid fuel open grate originally heated the house. This is evident on entering the room, in the projecting chimneybreast, which measures 31.5 cm deep by 1.37m wide. (The next post will consider heating, and the ways in which occupants used the alcoves over time, by considering the introduction of electricity). In common with many terraced properties, the original grate of No. 8 was removed some time ago (certainly before 1999 – probably several years previously. The exact form of the original grate is uncertain, although considering the construction date, it is likely to have been a slow combustion register grate, (in contrast to the earlier arch plate) consisting of an iron rectangular plate, canopy, and frame (which commonly contained a surround of glazed ceramic tiles), lined with ceramic firebricks. 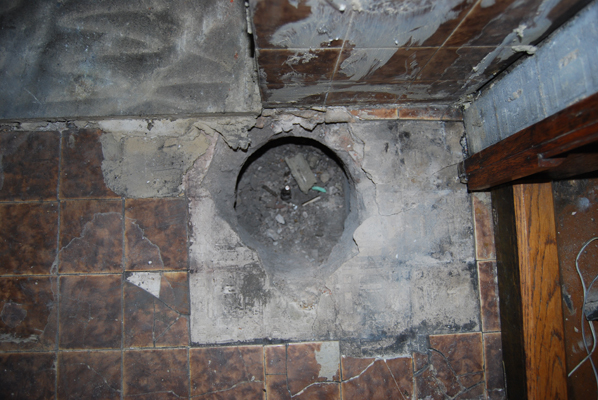 [ii] Without removing the flooring (which wasn’t possible during the survey) the size and form of the hearthstone is unknown; but stone hearths were increasingly tiled during and after the late 19th century. The position of early fireplaces within terraced (and other) houses can often be seen in rough outline, in cases where the fill (often plasterboard, the join with the wall feathered with plaster) isn’t flush with the wall surface (see the subsequent post on the front bedroom – such an outline is clear). In this case, a professional – who was clearly a very good plasterer – filled in the hole left by the previous fire, so it’s quite difficult to see the traces of earlier features (which are further covered by wallpaper). This is even harder to see in photos, so filters have been used to enhance the outline (see above). It is not possible to be certain whether previous residents acted in the same way as many other occupants of terraced houses in the 1930s – 50s: by removing the ‘old fashioned’ cast iron grate, and replacing this with a ‘modern’ fireplace. Whether or not this was the case, previous owners later fitted a gas fire in the place of an ‘open fire’: this was of a style found in the 1980s (which may still be purchased today). 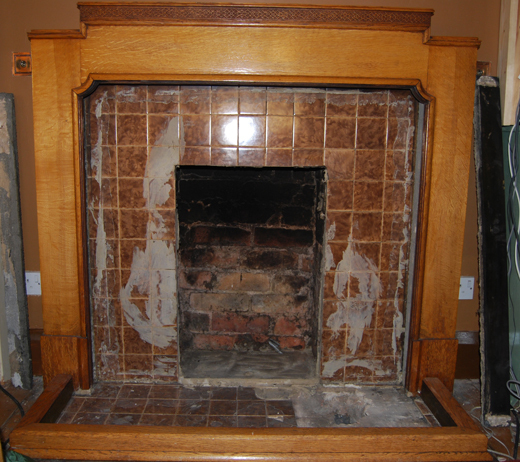 At some point in the past 5 years, the gas fire was removed for safety reasons, and the fireplace finally sealed. These seemingly practical and individual changes relate to broader social and cultural transformations; as there’s quite a bit of information to fit into this post, some of the factors behind changes made to heating, cooking, and lighting facilities will be discussed in the next post on ‘home comforts’. following post will examine decoration. 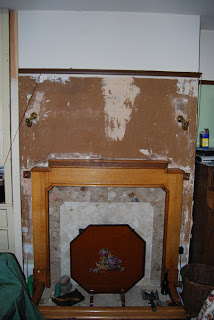 An area of plaster has been removed from an interior wall (between the front room and the stairs) – hidden from sight within the cupboard of the right-hand chimneybreast alcove. As expected for work not destined for display, the finish is much rougher than that of the brickwork at the front of the house (see the previous post). This interior wall is again built using a Flemish Bond, and would have been covered with two or three coats of lime-based plaster. The floor feels different beneath the visitor’s feet today, compared to how it would have done originally: modern cushioned laminate flooring overlays the original timber floorboards. Unfortunately, it hasn’t been possible to get to see beneath the modern surface to be certain of the finish of the boards throughout the room. However, the alcoves either side of the chimneybreast now contain shelves and modern (1990s or earlier) cupboards. The floorboards are visible within both cupboards, and as would be expected from comparisons with neighbouring and similar housing elsewhere, they are likely to be ‘deal’ (pine), or fir. These boards are not stained, which is unusual for a house of this age and type (as can be seen in a photo of floor boards in the back bedroom; this form of decoration will be considered in a subsequent post); they are also relatively ‘fresh’ (compare with those in the back bedroom, when this information is posted). This may indicate that boards have been replaced, perhaps due to rot, or to insect infestation, such as woodworm; alternatively, the floorboards may have been sanded – an act that became particularly popular in the 1980s-90s – which removes decades of patina that demonstrated past taste; though they are not varnished, which often followed sanding). The discovery of fragments of wallpaper, tightly sandwiched between the wall and the ends of the boards, perhaps supports the possibility that the boards have been replaced, although subsequent modifications may have pushed the paper into this position, or boards may have been lifted in fitting or modifying gas piping. The style of the wallpaper (which will be considered in the post on decoration), suggests that if replaced, this was undertaken some time ago (perhaps 1960s-70s). Another indication that, if replaced, this was not done recently, is the beading that seals the gap between wall and skirting board (a technique to reduce draughts); this seems to have previously run around the room, but since been removed (perhaps when the previous – since removed – floor covering was fitted, between the late 1980s and mid 1990s). This beading overlies the ‘fresh’ boards, and underlies paint that pre-dates the 1990s decorative scheme, which also overlies the adjacent skirting board. 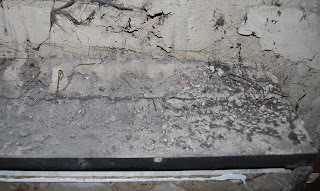 Around the base of the walls, what is likely to be the original skirting board can be seen. When painted, it is often difficult to determine the age of skirting board, as modern replacements commonly replicate early profiles, although early skirting boards often have less crisp lines than modern examples (original board are sometimes damaged, decay through rising damp, or may be removed during modern damp proofing). Within the left alcove cupboard, there are only partial remains of skirting board; the paint on the wall – perhaps like the later wallpaper (see the subsequent post on decoration) – continues down to the floor. 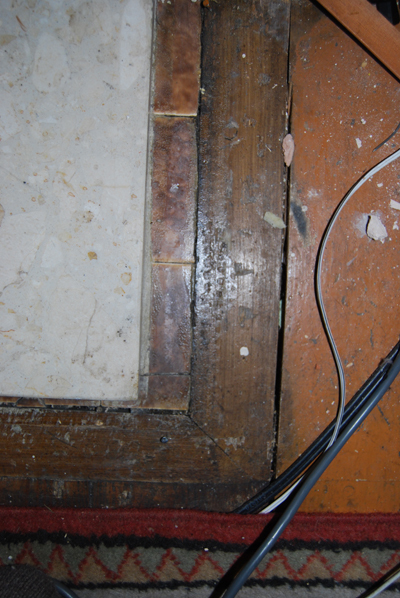 This may indicate that the builders did not fit skirting board within this corner, suggesting the presence of a fixture (such as a fitted cupboard) within this corner during early occupation. A further clue supports this interpretation: paint remains suggest that the skirting board turned at right angles from this stub to meet the face of the chimneybreast. In addition, the vibrant blue wall colour appears only in this alcove: from the skirting board stub in this alcove, and in the right alcove, the wall finish is different. The pattern differs in the right alcove cupboard. Here a power socket was fitted or modified during the late 20th century on the wall of the chimneybreast. This has led to the removal of the short stretch of skirting board on this wall, revealing the original surface and subsequent early decorative traces at the point where it joined the skirting on the back wall of the alcove (a subsequent post will discuss decoration). As many (especially builders and DIY enthusiasts) will know, though decorative, skirting board has a practical purpose: by leaving a gap between wall plaster and floor – the skirting covering this gap – rising damp could to some extent be limited. It is also a useful buffer to protect the wall from wet mops! Many houses of this date are fitted with usually wooden picture rails – these features continued to be fitted in houses during the interwar period (although the profiles were usually simplified during the 1930s), but were often removed during and after the 1950s, during modernisation. Removal of wallpaper from the chimney-breast during renovation revealed no indications that a picture rail had previously been fitted; it’s not been possible to remove wallpaper elsewhere in the room to see if this is representative. 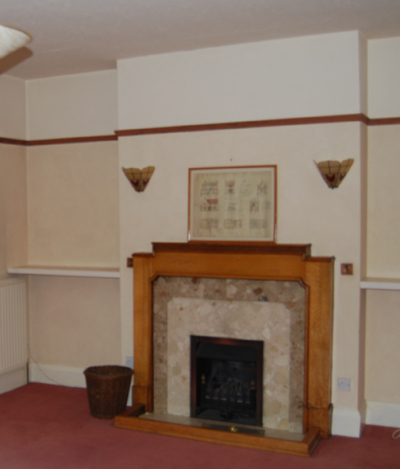 However, the walls in this room (and in other rooms) that are painted (and not papered) have no indications that a picture rail was previously fitted; there were also no signs of picture rails in a neighbouring property; further investigation of other neighbouring properties may answer this question. The front room of No. 8 is bright – not only due to the magnolia emulsion that is ubiquitous within modern houses, especially rental properties such as this. The window, which fills much of the wall behind the front door, lets in quite a lot of light; this may relate to legislative changes made not long before the house was built. The Public Health Act of 1875 provided guidelines for byelaws on room and window size for newly constructed houses; although the adoption of such guidelines by local authorities was a gradual process, c. 1600 councils had adopted the national models by 1882. [v] Concerns over the need for sufficient air and light to limit disease instigated the development of byelaws during and after the 1860s to regulate the construction of smaller houses; the height of the rooms (in comparison to earlier ‘cottages’) also aided airflow – a concern that was to continue into the 20th century. [vi] Maps suggest that when No. 8 was built, the aspect was as open as today (being situated across the road from a graveyard, beyond which were the railways lines of the goods yard), and that light filled the room as it does today. The previous post discussed the original form of, and subsequent changes to, the window as seen from outside the front of the house. These changes are also visible from the inside: much of the original frame is intact, although the glazing bars have been removed, in order to insert two large panes (the significance of fitting ‘picture windows’ was also discussed in the previous post). The door that faces the visitor as they enter from the street is probably one of the original fittings of the house. It is in a style typically found within terraced houses built during the late 19th – early 20th century: there are four panels, each of which are framed by thin architrave. However, this door may not have originally come from this doorframe. As can be seen, previous residents have stripped the paint from this door; occupants often undertake this task themselves (using either a heat gun or chemical paint stripper), with the door in situ – there is some evidence of this (burn marks and ineffective paint stripping) on this and other doors in the house. But doors are otherwise often removed and taken to professional paint strippers (where the doors are dipped in vats of caustic chemicals); and when returned – as all the doors of the house are often removed, stripped, and refitted, at the same time – they are not always put back into their original frame. There are a few clues that may point towards a door being replaced within a different frame to that from whence it came: the original position of locks can often be seen, as can the latch housing in the frame – sometimes these features do not align. But if doors have been subjected to professional paint stripping, shrinkage (which can frequently be seen by cracks and gaps in the panels) must be taken into account. The removal of paint, to expose the ‘original’ timber fabric of door became popular in the 1980s (and continues today), in part relating to a taste for original features. However, this practice in no way reflects Victorian, Edwardian, and interwar tastes: doors were almost always painted (with the occasional exception of the oak and mahogany doors set within panelled rooms) – this will be considered in a following post on decoration. Doors of this type were often boarded over during the 1950s-70s, in order to attain a flat surface, which was seen as modern (flat door surfaces began to appear within wealthier houses from the 1920s onwards). This can often be detected (as it can with this door) by the presence of small holes around the edge of the door, where panel pins held a sheet of hardboard in place; many of these coverings were removed during and after the 1980s, when tastes for ‘antique’ fittings became popular, although some still remain in place today. The presence of a large hole in the door, indicating removal of the original handle, and the fitting of a (probably more ‘modern’) higher in the door, may date to this phase of modernisation. Having described the main features of the room, the following posts will go on to consider utilities (such as gas and electricity), decoration, and social significance of the front room in No. 8, by making comparisons with similar houses, by exploring written, visual, and oral history, and exploring the changing use of the room. [i] See Deetz 1999, for a wider discussion of the importance of examining the ‘common place’ traces of daily life in historical archaeology. Past owners and inhabitants inscribe their presence and existence upon building façades. No. 8 provides a typical example of this: though originally constructed in the same style as neighbouring buildings (probably at around the same time and by the same builders), there are differences between this and other houses, which themselves often in some way differ to one another. This variety reflects the stories of the street, each modification marking a point in time when someone connected with the resident (whether tenant or landowner, builder or painter) interacted with the house. And, although we often think of such transformations as purely personal choices, unrelated to wider social, political, and economic change, this is rarely the case. Some of the more noticeable changes will be considered briefly below. A glance along the street would suggest that it has changed little since its construction during the late 19th century – bar the move evident signs of modernity: the few cars belonging to residents, the church hall now built over the old graveyard, the tarmac covered road and pavement, and the numerous television aerials. But standing outside the front of No. 8, some of the changes made to this and adjacent buildings become obvious. The latest change – not to the house itself, but the installation of a feature directly outside the house – is the replacement of the street light last year by the City Council. This is the product and development of changes made to planning legislation in 1990, which included regulations surrounding ‘listed’ buildings – those recognised for their historic significance – and the designation of conservation areas: places of “special architectural or historic interest the character or appearance of which it is desirable to preserve or enhance”. In this case, the Victorian origins of the street has been emphasised by the style of the light – or ‘lantern’ as the work specification refers to this feature. Another relatively recent change seen along the street is the installation of equipment for cable TV and phone line, manifest in the faded brown plastic boxes appended to the fronts of houses – somewhat incongruous with the ‘re-Victorianisation’ of the smart new old-fashioned ‘lantern’. This was undertaken during the late 1990s – early 2000s, and both reflects broad technological developments, and transformations in the use and meaning of domestic space – at a time when the home was increasingly seen a place of entertainment and leisure. Such changes, in conjunction with, for example, economic developments (such as supermarkets offering inexpensive alcohol), and other technological developments (such as ‘home theatre’ equipment), have affected local economies. Social venues (such as public houses) that were hitherto significant community locales increasingly found (and continue to find, according to publicans) it difficult or impossible to survive, further affecting social relationships outside the home, and influencing the transformation of community identities. But the most noticeable changes are those made to the door and associated features, and to the windows. Sometimes they are removed completely; the invention and widespread ownership of vacuum cleaners from the 1960s onwards may have made them less necessary. Although it is possible that No. 8 was not in fact fitted with a scraper, the disorderly bricks (attempts have been made to sustain the Flemish Bond of the other brick courses, although this has necessitated substantial trimming of some of the bricks used) suggest that a scraper was at sometime removed (although if this is the case, it appears that old bricks were used to fill the remaining recess. The door is a 1930s replacement, made of timber with a leaded stained glass light. Immediately above the door is a cast iron number plate (perhaps fitted at the same time as the door). And the original light above the door – which is can be seen from neighbouring properties once consisted of 10 small panes – has been replaced by reeded obscure glass, again perhaps at the same time as the door (it is interesting to see early – perhaps original – crown glass in the light above the door of the adjacent house). The door has been painted several times since it was first fitted, although the original colour is yet unknown. Many local terraced houses have been fitted with similar doors; the date of this change is perhaps significant. House ownership was becoming possible for members of the lower middle class – in some cases, for well-paid working class families – during the 1930s. But house purchase was still beyond the majority; nevertheless, improvement are common during this time, which will be discussed as each room in No. 8 is explored. With regard to notions of home, the front door is one of the most important features of a house: it is the interface between the inside and outside world – between the familiar and predictable, and the strange and potentially dangerous. The door may be used a tool of power and autonomy, as others are prevented or allowed to enter our domain. But ‘behind closed doors’ not only stands for privacy – it may also stand for concealment and confinement: the home is not always safe. The door furniture is mostly of lacquered brass, fitted sometime before 2001, perhaps incorporating an attempt at ‘period’ style; but the usual wear to the finish – which, in theory, provided a traditional look, but without the effort of regular cleaning – detracts from the appearance, which is now somewhat shabby. To the left of the facade is a 2 light sash window; although the two sliding frames are intact, the retention of original windows (some containing early, possible crown, glass) within many of the neighbouring properties indicate that an astragal (wooden glazing bar) previously divided the upper light into 18 panes, and the lower in two. Above this window, more drastic changes have been made by the complete removal of the original sash window, and by its replacement by a two light, top hung, casement window. Fortunately, both windows retain their original stone sills. It may be presumed that these changes took place before Conservation restrictions were put in place: if new windows are to be fitted nowadays, they must replicate original style and (to some extent) materials. The insertion of ‘picture’ windows was common practice during the 1970s and 80s); although often seen as a step forwards aesthetically, one of the main reasons behind such a change was the ease of cleaning such windows, in comparison to those with many small panes of glass. [ix] Relationships between such acts of modernisation, and between changing gender roles and the increasing number of women that worked outside the home, might be conjectured. From the top photo it can be seen that the original chimney stack remains, accompanied by possibly early chimney pots (as many houses in the street have the same type of pot, as can be seen from the second photo). This differs from many terraced houses, where pots are often removed, or replaced with cowls, as they are no longer needed, thanks to gas fires and central heating. The remaining chimneys and their pots place these terraced houses – like many thousands of Victorian (and earlier, and later) houses in Britain – in the contexts of British industry and technology. As a nation then with plentiful supplies of coal, this was the fuel of choice for industrial areas. But as notions of comfort, technology, and economies changed (which incorporated the effects of changing gender roles – as more women worked outside the home), other forms of heating became preferable, which, as noted, sometimes led to the transformation of chimneys. The chimneys also give a clue as to the use of interior domestic space: their placement within fixed points in the home to a large extent determined use of each room. But other factors - economic circumstances, notions of ‘respectability‘, illness, and changing concept of ‘comfort’ - influenced how these facilities. This will be discussed further as we move through each room of the house in future posts. For now, external remains make it apparent that sources of heat were provided for the front and back rooms; the double chimney pots suggest that the rooms above were also served with fireplaces – although other evidence indicates that they were rarely used: this topic will be covered at a later date. Finally, the original cast iron guttering has been replaced during the later 20th century with plastic guttering – a cheaper, perhaps more easily maintainable, alternative, but not in keeping with the style of the house. The narrow facade of No. 8, whilst seemingly demonstrating attempts at individuality, in exhibiting aesthetic choice, and in undertaking ‘modernisation’ in relationship to personal needs, these changes embody broad social relationships, political power, economic change, and technological developments. The process of change continues, as the house undergoes another decorative renovation. The interaction of individual, family, community and nation is writ upon the house, as are the different ways of life that each generation experienced. If you have any information, memories, or photos to share that relate to the topic of this post, or have evidence for life in the past in your house, please contact the Project Director. [i] For mention of hanging baskets on working class houses in the early 20th century, see Foley 1977: 7; see also Upton 2001, fig. 62. Window boxes and plant pots on window sills may embody similar notions of pride, although occupants perhaps gained greater benefits from the blooms, which were often seen as ‘cheerful’ in the absence of a garden: see Layton (1977 : 2), though were also found on sills of houses with gardens (Upton 2001, see figs. 12, 25, 48, 62). Upton (2001, fig. 67) notes the establishment of a Window Gardening Society in Birmingham in 1904; boxes and pots were of course often the only option for tenement housing. [ii] See Muthesius (1982: 55, 238), for a brief discussion of the development of associations between cleanliness and respectability, and of the role of whitening in social differentiation. Lime-wash had been used (being painted on exterior walls) during the 19th century in the belief that this would prevent contamination from infectious disease (see Upton 2001: 35, 85); this may have further associated notions of cleanliness with step whitening. [iii] An example of a whitened step fronting a terraced (or back-to-back) house in Birmingham during 1904 can be seen in Upton 2010, fig. 65; however, a sign indicates that the house was occupied by a building contractor, and perhaps suggests middle-class pretensions, despite the ‘poor’ location. A photo that possibly shows a local example is in Palmer 1997: 91, though this may simply be due to very light stone, or the use of paint – it is in any case a local business (The Nottingham Castle Public House): ‘respectability’, and especially signs of cleanliness, were perhaps particularly necessary. Probable examples are in Palmer 1998: 77, top left (Bridge St.), and 118, top photograph, left (again Bridge St., 1930s). From most photos of local terraced houses, it appears that whitening, at least, was not as widespread or regular as memories might suggest; however, the possibility that step reddening is less easy to detect in early and poor quality black and white photographs and their reproductions remains. For an account of local practices, see Goodhead (1983: 26, 27); she mentions that, in the nearby West End, some cleaned and whitened their steps, but this was not universal. Mike Green (Green n.d.) mentions the step reddening; he goes on to describe the morning ritual of scrubbing and whitening (using pipe-clay) the front door step (and scrubbing an arc of pavement beyond the step) of two-bedroom terraces houses within inner-city Derby during the interwar period. Memories from outside Derby also record this task: in Kettering (Hankins 1999: 23); and in Liverpool. [iv] There are records of men or more frequently, boys employed in domestic service undertaking this task (Thompson 2005: 77); but it remained predominantly ‘women’s work’, amongst those of the least tolerable kind. [v] Step cleaning and whitening in the Edwardian Period is noted, e.g., in Arthur 2006: 198; Horn 2001: 12; Thompson 2005: 24. For the interwar and wartime periods (particularly in the context of domestic service) see: Dawes 1973: 84-5; Horn 2001: 181; see also Goodhead 1983, for local history. See also Muthesius 1982: fig. 27. [vii] For an Edwardian example, see Thompson (2005: 24); for testimony relating to ‘step girls’ in earlier decades, see Layton (1977 : 9). [viii] See Muthesius 1982: fig. 28, for a more complete example. Due to erosion and heavy use, the bars sometimes needed replacing; this is mentioned in the late Victorian fictional Diary of a Nobody, by George and Weedon Grossmith, for example.